Take a look at how Rotary Clubs around District 6910 are making a difference...Rotary Serving Humanity. 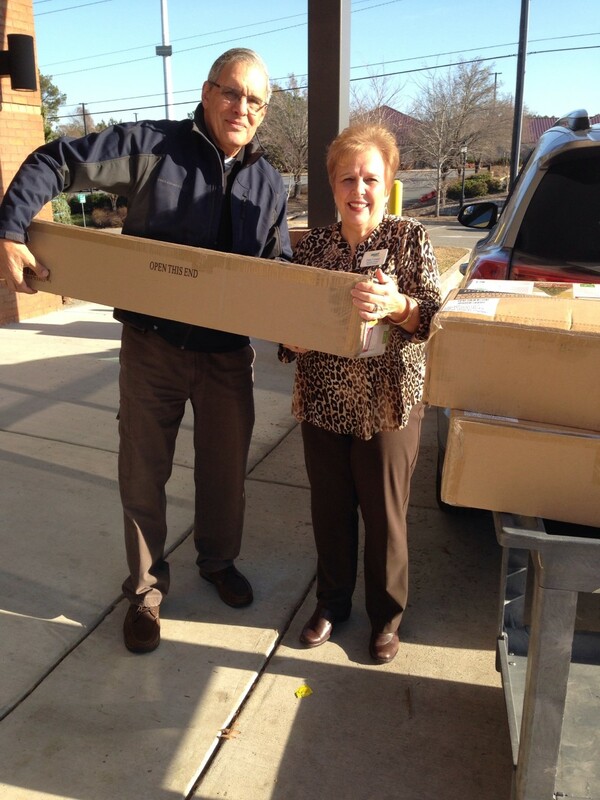 Our club just provided 100 Christmas meals to ACTS--Area Churches Together Serving. 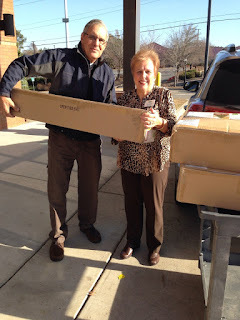 These meals were distributed on Tuesday, December 20th to local families in need. This is the food bank that serves Oconee County. Our club is small in number--just 24 members but big in giving!! 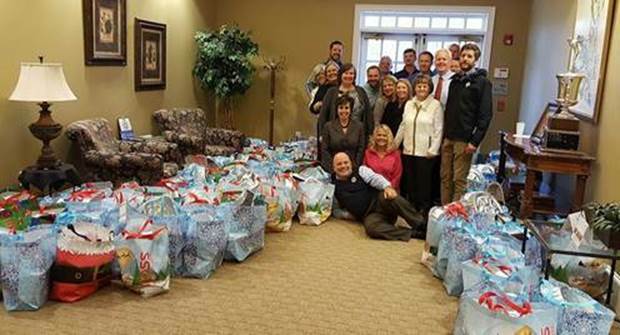 The Rotary Club of Cherokee County added Christmas Cheer to its weekly MUST Ministries bread delivery. Publix of Towne Lake generously contributes bread each week to MUST Ministries through The Rotary Club of Cherokee County. This season The Club delivered fourteen self lit Christmas Trees to MUST for those in need of Christmas Cheer. MUST Ministries is a non-profit, faith-based organization helping people in our community break the cycle of poverty and homelessness. MUST provides basic necessities such as food, clothes and housing, free of charge. George Lopos presents MUST Thrift Store Operations Manager Dale Cooper with one of boxed trees. 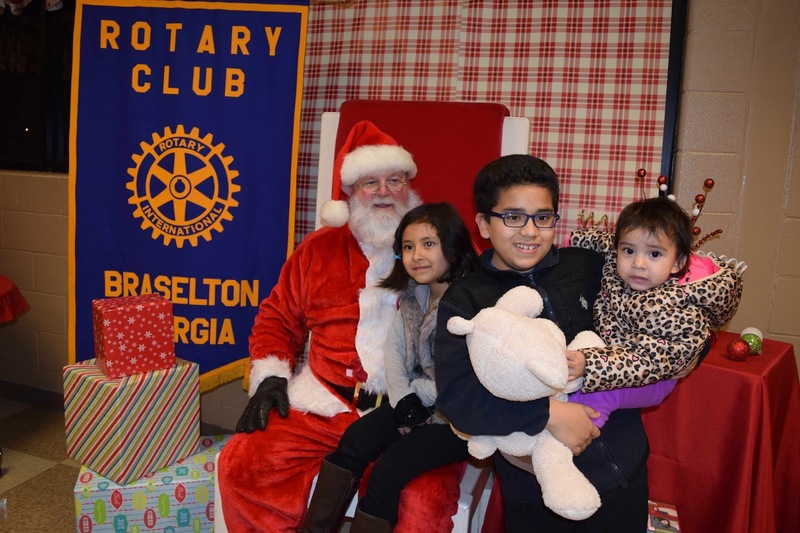 When it’s holiday time in Braselton, which is hosting a year-long Centennial Celebration to mark the 1916 official chartering of the town, the Rotary Club of Braselton kicks it into high gear for the community. The Rotary Children’s Christmas Raffle, an idea that has grown in its 11th year history, was held Nov. 4 at The Venue at Friendship Springs, marking a change in location as well as an expansion of the fundraising raffle. Martha Martin, the club’s 2005-2006 President, suggested to her successor Steve Clark that a reverse raffle similar to that of another organization in which she was involved could make a great signature event for the club and that is what the reverse raffle has become with $50,000 netted this year to purchase Christmas for hand-selected children and host a special holiday party for those children, their families and others. 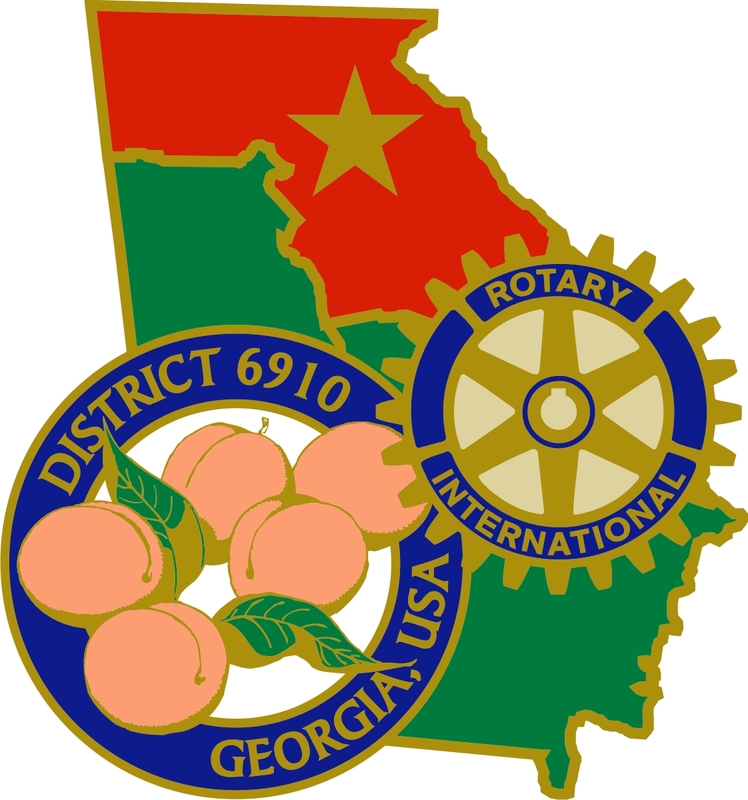 Proceeds also support other youth-related community needs including scholarships, the Interact Club at Mill Creek High School and the Georgia Rotary Student Program. 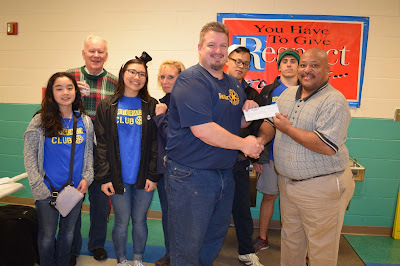 The club is also donating a total of $9,000 toward computers for Foothills Education Charter School’s Jackson County Campus, due in part to a Rotary District 6910 matching grant and a private donation of $3,000. Initially for the raffle, Rotarians sold 300 raffle tickets at $100 each to bring in $30,000, and the person whose ticket number was drawn last would win $10,000. The remaining proceeds would be used to host a raffle party and purchase Christmas for hand-selected children. At the party, 300 numbered ping pong balls would go into the cage with numbers drawn during a several hours-long party when barbecue and other eats and treats are enjoyed. The first number drawn got their $100 back. This year, there were 500 numbered balls, and Stonewall’s BBQ catered the event which also included door prizes and a silent auction and two live auctions of travel opportunities: a Highlands, N.C., chateau stay and a trip to Italy. Happy winners! The Rotary Reverse Raffle has become an evening of fun and fundraising. At the raffle event, periodic checks and balances are done. When there are only 10 remaining balls, an audit is conducted, knowing the end is near. When it’s down to five, phone calls are made to determine if those five agree to split the $10,000. If not, the drawing continues. On many occasions, the pot has been split as was the case again this year with the reverse raffle winners agreeing to share the $10,000 top prize. Congratulations to Tommy Zilahi, Joe Hicks, Teresa King, Gail Hail and Sharon Bryan. Alvin and the Chipmunks made a return appearance to the Braselton tree-lighting event in the new Town Green on Nov. 12 wearing new costumes to entertain delighted children of all ages who also saw many groups performing holiday dance and musical numbers before Santa made his special appearance. The jolly old elf helped light the Christmas tree and, magically, snow began to fall (thanks to the efforts of the West Jackson Fire Department). At the tree lighting, Rotarians and volunteers handed children bags containing an apple and orange and a couple of pieces of hard candy. 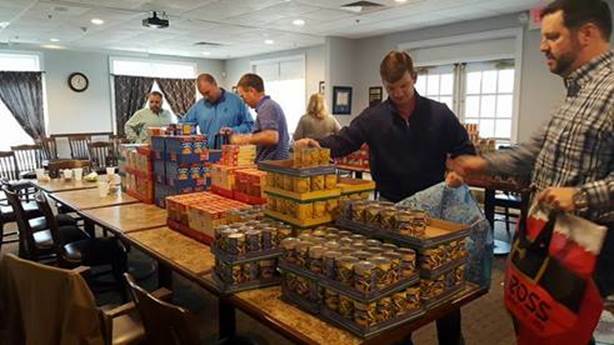 Rotarians had prepared the town-supplied bags with town candy and fruit donated by Whole Foods Market distribution center in Braselton. In the early days of the Braselton Brothers Department Store, times were hard in the rural area and the celebration of Christmas reflected the meager living families were able to make during the time. The Braselton Brothers annually hosted a holiday kickoff in the store parking lot with Santa Claus and other fun to be entertained and holiday arrivals inside the store could be showcased. Each child and senior received a fruit bag – and, for some, that was their Christmas gift for the season. That tradition is carried on, explained Rotarian Martha Martin. The Running Elves 5K and fun run, planned as an annual fundraiser by the Rotary Club of Braselton, was held Nov. 19 with more than 100 ­­registering to participate in support of the club’s charitable and community service efforts which include a Christmas party and holiday love for 100-plus area children, Rotary scholarships for high school graduates and support for local schools. The race began and ended at Braselton’s new Town Green. The top three schools with the most participation received financial support of $750, $500 and $250, while the Boys & Girls Clubs of Jackson County also was presented a check to further the clubs’ support of youth. West Jackson Elementary had the most runner/walker participation, followed by Mill Creek High School and Jackson County Comprehensive High School. “Rotarians are happy to support our schools,” said President Chad Bingham, who noted that Foothills Education Charter Schools was the beneficiary of support from Rotary which included $6,000-plus to go toward computers for the use of students at the East Jackson Comprehensive High School location thanks to a matching grant from Rotary District 6910. The top Running Elves 5K finishers were 14-year-old Paul Pollock of Buford winning the 5K with a time of 17:31.8 with Crystal Hamilton of Jefferson as the female winner with a time of 23:24.1. Hamilton was the 10th-place overall finisher. Overall fourth-place finisher was Hoschton’s Brayden Stewart, 11, with a time of 20:23.1. Second overall finisher was Gary Willie, followed by Gage McKay, Stewart, Nathaniel Hutchison, Ben Wiley, Joshua Smith and Steven Smith. Brice Branton, 11, of Hoschton, was the No. 9 finisher and the youngest of the top finishers. The club had been sponsoring the Run the Vineyard 5K for the past several years, however, the Chateau Elan Vineyard Run for Hope, benefiting the Gwinnett Children’s Shelter, was a schedule conflict so Rotarians took advantage of its being Braselton’s Centennial Celebration and provided a 5K and fun run on the morning of the town’s Celebrate the Holidays in Braselton festival and parade. The festival moved to the new Town Green this year. With the race change of venue and holiday time frame, Aimee Souto, Rotary 5K chairman and club treasurer, and her committee selected the Running Elves theme which carried through with the logo, mile markers, Christmas ornaments as award medals and an elf costume contest. Prizes went to the best dressed female elf, best dressed male elf and best dressed elf family. They were judged by Rotary President Chad Bingham. 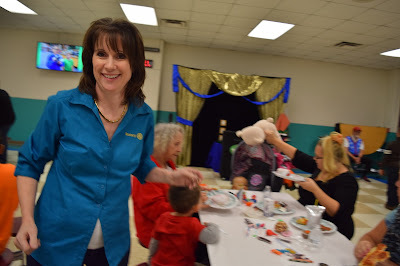 Rotarian Shawna Anderson of Anderson Physical Therapy Associates provided hot cocoa and cookies. Representatives of the Jackson County Boys & Girls Clubs manned the water station at the 5K’s halfway point. Sponsors of the event, in addition to Anderson Physical Therapy Associates, were Fit Body Boot Camp of Braselton, Colbie & Co., the Braselton Visitors Bureau Authority, Dental Care of Braselton, Funari Realty, Howard Hardaway State Farm of Braselton, Wilco Printing, Anytime Fitness and Georgia Transmission. Whole Foods Market distribution center in Braselton provided bananas for the runners. Runners Fit Race Works of Braselton was in charge of results. Final results posted here. On Nov. 19, Alvin and the Chipmunks were back to participate in the Braselton "Celebrate the Holidays" parade which featured Rotarian Martha Martin, a former Braselton Brothers Department Store employee and Jackson County's first Woman of the Year, as emcee alongside Robbie Bettis, who owns and operates Braselton Antique Mall, located in the former Braselton Brothers Store building in historic downtown Braselton. The crowd lining the parade route along Highway 53 ­­­loved the Chipmunks thanks to the antics of Rotarians Michele Rasmussen, Monica Jackson and Tundi Massey Jones whose daughter, Makinley, helped a Rotary elf toss out candy. President Chad Bingham and driver Don Carroll, husband of immediate past president Leigh Carroll, tossed out candy, under the supervision of Makinley’s grandmother, Julie. In December, Rotarians will host a party with pizza, burgers, cookies and more for the children matched with Rotarians by Jackson County Holiday Connection. The kids and their families are invited to be entertained by face-painters, a magician as well as Alvin and the Chipmunks. The special guest of the evening will be Santa. While children are entertained and Santa is busy, Rotarians, as special elves, assist family members in getting bags of holiday cheer for the children, a ham donated by Polaris Aviation, Higher Grounds Coffee House and Two Ladies in the Attic and a food box for the family into their vehicles. Community support, including individuals shopping and wrapping gifts, makes this signature project a true giving experience. West Jackson Elementary School provides the venue for the party gathering. 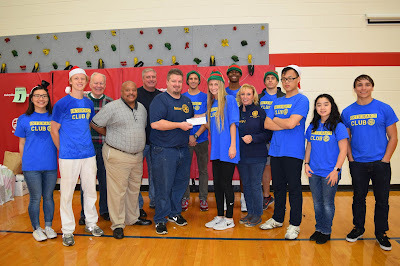 During Dec. 13's annual Braselton Rotary Club's Christmas Party for Children, President Chad Bingham presented a check for $2,500 to the Boys & Girls Clubs of Jackson County with Executive Director and Chief Professional Officer Michael Williams, a Braselton Rotary Club member, accepting the donation. The Rotary Club has a long history of supporting the organization and sponsored construction of the kitchen at the Jefferson club. Rotarian Paul Maney also assisted in the presentation. Children enjoyed pizza, burgers and cookies, activities including a magician and face-painting and then got to visit with Santa Claus. 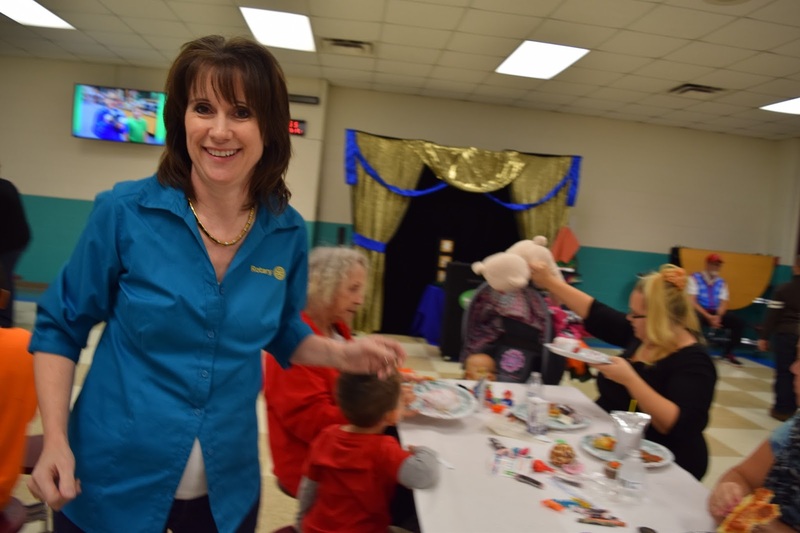 Rotarian Tracy Woodall helped serve up pizza and burgers to children and families selected through Jackson County Family Connection to be assisted during Christmas. In addition to clothing and toy gifts secretly wrapped up, the families received food boxes and a ham and gift box from Polaris Aviation. The Interact Club, sponsored by the Rotary Club of Braselton, accepted a $500 check to go to the Mill Creek High School Care Account for school families. 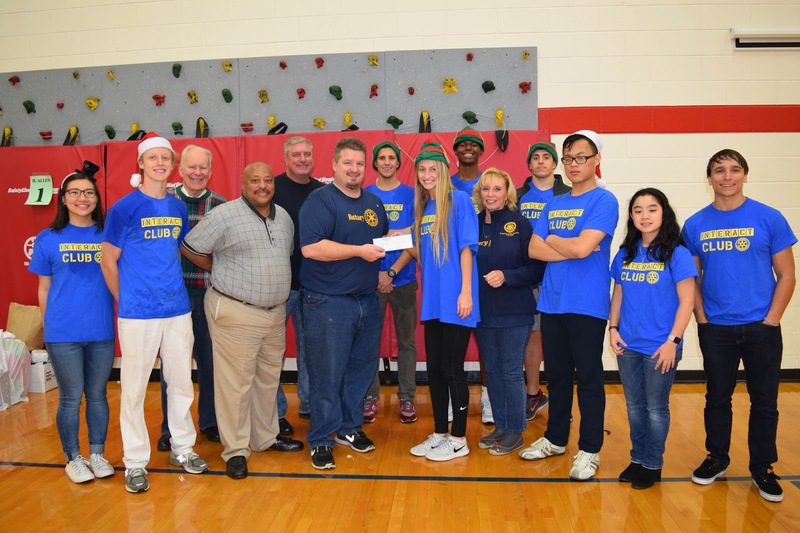 The donation represents the school’s second-place finish in number of participants in the Rotary Club’s recent Running Elves 5K and Fun Run held in downtown Braselton prior to the town’s Christmas parade. Rotarian Carolyn Smith coordinates with the Interact Club at the school. Interact President Madeline Gann accepted the check from Rotary President Chad Bingham. 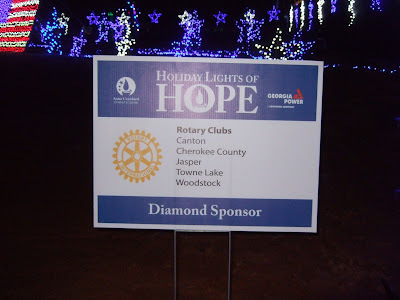 For the third year in a row, the Rotary Clubs of Area 16 in District 6910 (Canton, Jasper, Woodstock, Cherokee County, and Towne Lake) came together for a joint sponsorship of a light display at the now-preeminent holiday light show in Cherokee County to benefit one of the leading nonprofit organizations in the community. 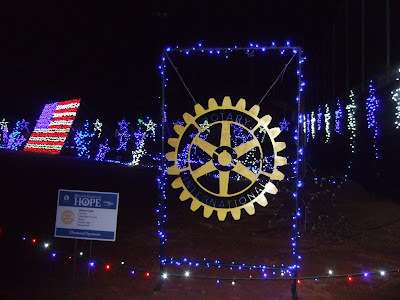 This year, for the second year in a row, the Rotary Clubs' holiday light display was an illuminated Rotary Wheel to support the Anna Crawford Children's Center's major annual fundraiser, the Holiday Lights of Hope. Anna Crawford helps children who have been victimized by sexual abuse by providing counseling and a forensic interview venue to avoid the multiple interviews and depositions that re-victimize sexually abused children going through the criminal justice system. The five Rotary clubs contribute not only their funds but also their sweat equity, each volunteering during one night of the two-week outdoor holiday light display to help run the event. The Rotary Wheel was fabricated by the metallurgy class at Cherokee High School exclusively for the Holiday Lights of Hope and serves as an emblematic representation of Rotary's presence in the Cherokee County community.